We already lived it once, one review is enough. There is no reason to keep replaying it over and over in your mind. Take what you can from it and move on. Getting over the past does not mean simply to erase it and move forward. It relies heavily on learning from it. If you break your arm, you can’t erase what happened, but you can learn from it and avoid whatever circumstance led to the break in the future. When I say move forward wisely, I mean to accept that the past cannot be changed and acknowledge that the future is open to influence. Realizing this can be the turning point of whether you are successful in letting go or find yourself stuck in the emotional quicksand that comes with living in the past. If you are going to move forward properly, you have to embrace your ability to transform your narrative. As much as we’d like to, you can’t do this in real life, especially with relationships. Accepting that we can’t change the past opens us up to structure the future. While we’re accepting truths like this, we need to do what I like to consider a self-inventory, by asking ourselves questions that clarify where we stand. The questions we automatically ask ourselves after a relationship ends rarely give us answers that help us move forward. Generally, they fall more in the category of what chains us to the past. What is most important to me at this point in my life? How can I make a difference from this point forward? How can I make my next move be for my best interest and well-being? The “woe is me” questions that we tend to ask without thinking about it are asking about things done in the past that cannot be changed. The Second set of questions are still asking about the past, but they focus on what we can take from the situation into the future to make progress and move forward. 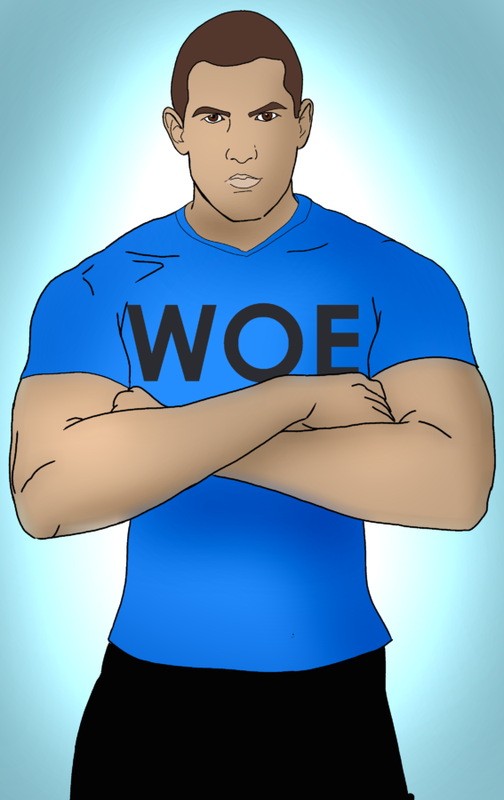 Quit asking yourself the “woe is me” questions! Continuing to expect valid and usable answers from this mindset is literally standing in the way of moving forward. I know people don’t really like to admit that they have… emotions…. And emotions have a way of leading us back into the past and then leaving us stranded. That’s why understanding those emotions is incredibly important once you decide to move forward with your life. 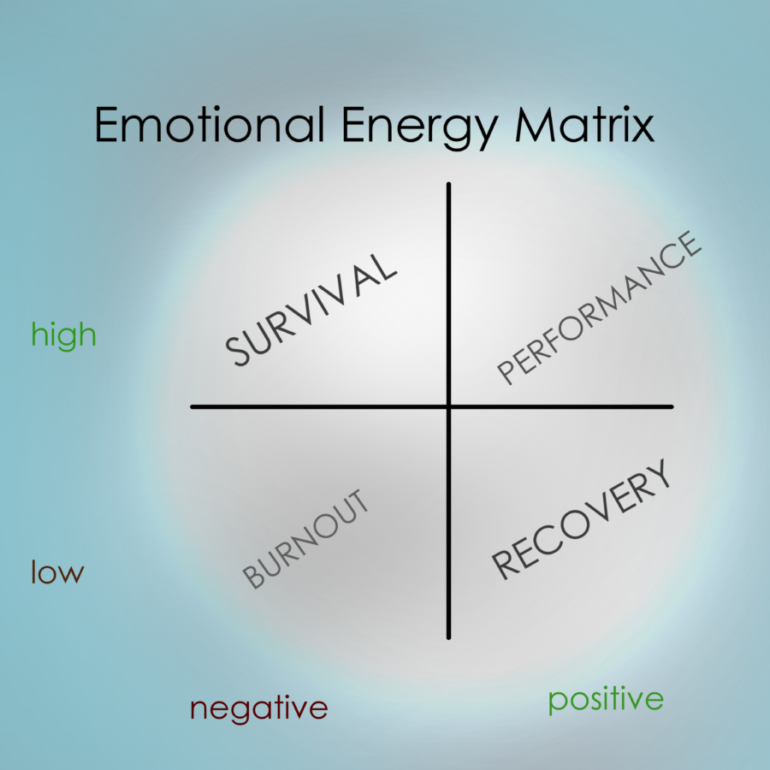 One of the most helpful things I’ve encountered as I’ve studied psychology and human behavior over the years is the Emotional Energy Matrix. Generally speaking, it’s easy to know when your energy levels are depleted. It is also pretty clear when you are in a negative state of mind. There are a few reasons this information is important. The most prevalent is that it takes a lot of will power to overcome the desire to give into the call of the ghosts of girlfriends past. And scientific studies have proven that will power is a limited resource. What this means for you is that if you spend your day using your will power to make it to the gym, say no to a slice of cake at a coworker’s birthday, and stay on task for the rest of the day at work, your will power might be depleted by the time you make it to happy hour at the end of the day. Combine that with the fact that you had a full day and the amplifying effects of alcohol, say like making you more tired if you’re tired. 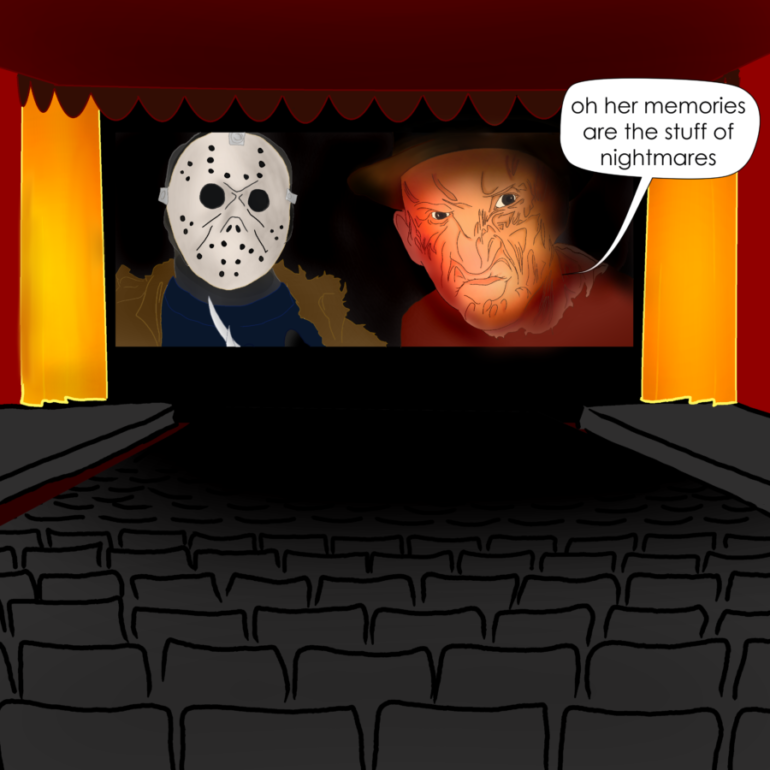 You’ll know that you need to avoid the topic of any painful memories because you’d be more likely to find yourself in a burnout situation, where you might, I don’t know, give into temptation and spend your entire night sulking over a beer, okay several beers, and skimming through old Facebook photos of you and your ex. Knowing where your energy levels, and your head is at, can act as a kind of warning and help you make a more suitable decision. You might decide to skip going out that evening or maybe just steer clear of the bar and avoid that negative mentality all together. As most of you know, I spend a lot of time riding bikes. And if you didn’t… well… surprise! Anyways, I’m not sure about bike laws anywhere else, but, where I live, road cyclists function as actual vehicles and have to adhere to the same laws as motor vehicles. It seems like almost every day there is another report on the news about a cyclist either being killed or horrifically injured in some sort of collision. A few months ago I collided with another cyclist. While that might seem like something quite comical, I assure you, running into Lez, who is not a small man was not unlike hitting a brick wall. I still have gravel working its way out of my elbow and I don’t think my thumb will ever be the same. That being said, after my wreck I was talking with a few of the veteran cyclists I ride with. Every single one of them stressed that staying aware of your surroundings and being “in the moment” is the most important thing when you’re riding. I’d take it one and a half steps further. It is important in life to stay in the moment and be aware of your surroundings. Interestingly enough, your surroundings are the next thing I want to talk about. I joke with my mother a lot because she has a tendency to hold onto things that symbolize things in the past to her and gets upset with me when I get rid of things that she thinks should hold meaning to me. If you’re holding onto things that still hold meaning regarding your relationship that you are trying to get over, you might be signing yourself up for failure. When I’m trying to get over something, the best bet is to try and set milestones that are reachable. For other people, I usually suggest setting a time period that you want to go without thinking of your ex in a negative manner. This tends to mesh nicely with the “control your thoughts” section I’ll cover in just a moment, but I’m going to leave it up here with getting rid of remnants of the past because they tie together. You’re thinking of your ex, right? We are programmed today to think of goals as things we have to constantly remind ourselves of. So, what I want you to do is set a goal of a couple of days to start with. Then forget about it. I know. But the thing is, right now, they’re on your mind a lot. This is why I left this part up here with getting rid of the remnants of your relationship. Remove everything that triggers memories, even good ones. I’m not saying you have to throw them out. I’m just saying box them up and put them away. I usually give them to a friend to keep safe. Then, after I reach my goal several times over, if I absolutely can’t live without something that has good memories tied to it, I ask for those items back and then have them get rid of the rest. Once you stop keeping the things in your life that make you think of your failed relationship, you can focus on bigger things, like goals for the future, things that make you happy, or things you had let slide during the relationship. Letting someone occupy your mind when they no longer reside as a part of your life is mental torture and one day, without even realizing it, you’ll suddenly notice that it’s been days since you last thought of them. Then, you’ll realize it’s been weeks. After you stop letting your ex lay claim to your thoughts, you’ll find that it’s easier to be happy for them in a sense. They may have been the biggest jerk on the planet, in which case they probably deserve splinter under their fingernails and to never have someone love them again. But the truth is, if you loved them in any sense, you’ll want them to eventually find happiness on their own. Maybe not now, but eventually you will be able to see them this way. I know it’s hard to imagine, especially if you were incredibly hurt by them, or if the split is still fairly recent, but once you come to peace with the situation it’s easier to see them as someone you once cared for rather than someone who simply hurt you. If you truly want to move past this hurt you’re feeling, then seeking this frame of mind where you can with them well is the best way to go about it. It isn’t something that will happen overnight, but it should be the route your try to shoot for eventually, simply because it will be the one that gives you the most peace of mind. I’ve been in mentally abusive relationships in the past, but eventually I came to terms with what happened and accepted this way of thinking. You don’t have to let someone else’s toxicity poison your mind as well. If you allow it to, then it will seep into other areas of your life. Realizing that there may have been reasons why it didn’t work out that weren’t clear to you before can bring about a clarity that I can only describe as maturity. Wanting someone to suffer simply because they hurt you is incredibly rash and childish and thank goodness it is temporary. If you take the time to look past any anger and hurt you’ve felt since your breakup and re-evaluate the experience, give up any naÃ¯ve perceptions, and redefine what it takes to be happy, then you might not only make it through this, no matter how hard it might seem. In fact, I know you can. Figuring out that it takes something more than another person to make you happy is one of the most liberating things you can discover. If you focus your thoughts more on staying positive and finding things within your control that bring you joy, you can leave the negative thought surrounding the loss of you your relationship behind. Another type of thought you have to be leery of are distorted thoughts. These are the ones you tell yourself to rationalize the things you do. My dad holds onto one distorted thought that completely eludes me regarding his pack -ratting really random things in his shop. I say pack-ratting, because they have a layer of dust so thick covering them that half of the time you don’t even know what they are. One of the items is old oil lanterns that he finds online and at garage sales. It’s not quite hoarding, more like collecting if I were to be nice about it. I can tell him all day long that I’d be more likely to donate them forgive them away since I don’t have time to appraise and refurbish them now let alone once I’ve taken on responsibilities like a mortgage or even a family. I’m kind of a neat freak, and hate clutter. Yet his rationalization, or distorted thoughts, that make it okay for him to have like 30 of them collecting dust, don’t take that into account. In fifth grade I had a teacher that made us memorize the Declaration of Independence and The Preamble to the Constitution. I can still quote the entire thing. Okay, I can sing the entire thing. Yes, I know, talent. Don’t all line up for my signature at once. But this line always stood out to me. No, not because it was followed by “All men are created equal” and I felt strongly about that. No, it was because if we are truly honest, there is almost nothing that is self-evident these days. Our minds play tricks on us. We convince ourselves of things that aren’t true. And we rely on other people to provide us with facts. Even as a kid I knew that there were very few things we could hold onto as “self-evident”. So when you stop telling yourself stories to make yourself feel better and you begin to accept certain truths, it becomes a lot easier to let the responsibility to control them slips from our shoulders. For example, telling yourself that by spending every day in the gym your ex will come back to you. You can’t control your ex’s actions or feelings any more than you can convince the ocean tide to cease its endless ebb and flow. Worrying about things you can’t control will only drive you mad. I once had a friend that convinced himself that if he got a certain job and had a 4.0 GPA in college, that his father who had left when he was a kid would return and be proud of him. While this was great motivation for him, he was setting himself up for disappointment despite his great achievement. He did graduate with a 4.0 and became a very successful lawyer with his own practice. I ran into him a few years ago, and found out what he had discovered regarding his dad whom he hadn’t hear from since he was seven. You see pursuing success had afforded him the opportunity to hire a detective and find out what had happened to his dad after he left. Apparently, his dad had gotten remarried had three other kids and then found himself in jail for tax evasion where he died long before my friend ever even decided which college he wanted to go to. You see by letting yourself believe things that are not true, you are denying yourself the opportunity to live in the actual present. I challenge you to let go of any lies that you’ve been telling yourself. The lifting of that weight alone will bring you a feeling of peace that rivals any fairy tale ending you could possibly imagine. I touched on this earlier, but realizing that people have reasons for doing things that you may never know or understand. While our automatic reaction when wronged or hurt is to lash out or hold a grudge, realizing that doing so will poison everything you touch as long as you hold onto it. Any future relationships will be a constant comparison to your failed ones as long as you hold a grudge. Even as I’m writing this I’m realizing that I need to heed my own words, since minor aggressive thoughts toward my ex keep popping up as I type. I may not understand why he did what he did fully, but I know that he had his reasons for hurting me and betraying me like he did. Just like anyone who may have hurt or betrayed you did. By accepting that you may never know the real reason and letting go of the frustration that comes with it. It will no longer weigh on your heart, leaving you open to find happiness in the future without and hindrances. Doesn’t that sound much better than carrying poisonous thoughts of your ex into your future relationships and letting it touch everything positive in your life and, like a plague, turn them all negative from the inside out? Besides, allowing someone that toxic to walk out of your life can only be a blessing. The only time he threw that phrase at me was when I would blow him off because I was so busy researching something with total passion and abandon that it seemed like I was crazed, thirsty for knowledge. The reason it is so is because when you chase something you truly care about without having negative emotions tied to it, you aren’t just doing it for survival, you’re doing it to be the best. If you are doing a job that you don’t particularly love but you are highly motivated, that would be survival. It gets the bills paid. And while paid bills are nice and all, that doesn’t mean you take any pride or joy from doing so. Set goals that you believe in and that give you purpose. You see, chasing something that lights that kind of fire in you when you have something like a grudge or negative feelings tying you to a relationship that didn’t work out in the past is like trying to climb a rope in gym class with an anchor tied to your ankles, darn near impossible, unless your superhuman. Even if you were bit by radioactive spider or from another planet, emotional anchors can be even more damaging to your success. So my suggestion to you if you wish to move on and get over that crappy feeling you’ve been dealing with, is to cut the anchor loose. Set lofty goals and then chase them like crazy. I can’t think of any more way to say it, but I’m guessing you get the idea. Just take the advice in this article and put it to good use, and I won’t tell anyone that for a second even you had emotions. It’ll be our little secret.